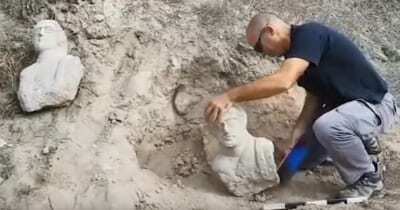 Two impressive Roman busts were found this month near Beit She’an – thanks to the alertness of a local resident, who spotted the top of one of the busts’ heads sticking out of the ground as she was taking a walk north of the old city. The woman and her husband called the Israel Antiquities Authority Theft Prevention Unit, and inspectors were quickly sent to the site. Together, they unearthed the first bust and as they worked, they found another one right next to it. The busts, which date to the Late Roman period (3rd–4th centuries CE), were taken to the Israel Antiquities Authority laboratories to protect them from theft and to study and preserve them.